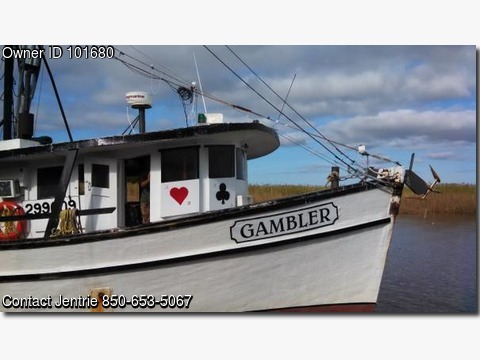 Boat is located in Apalachicola,Florida.Please contact the owner @ 850-653-5067...SHRIMP BOAT 'GAMBLER' FIBERGLASSED OVER 2" CYPRESS PLANKS 671 WITH 4 1/2 ALLSION CLUTCH 10 K GENERATOR STRATUSBURG 515 1/2 WINCH NEW FUEL TANKS 1000 GALS ALL FIBERGLASS NO WOOD WITH BAFFLES,NEW A FRAME GALVAIZED RIGGING 2 B PUT ON, NEW AUTO PILOT SITEX FURUNO DEPTH FINDER SITEX WIND PLOTTER, FRESH WATER 200 GALS. IN THE WATER AT THIS TIME WORKING. 4 MORE INFO CALL OR TEXT.